Hello, friends! Today is day TWO of the Design Team reveals for the Girlfriend Collection coming from CAS-ual Fridays Stamps this week! I have another super fun card to share with you. 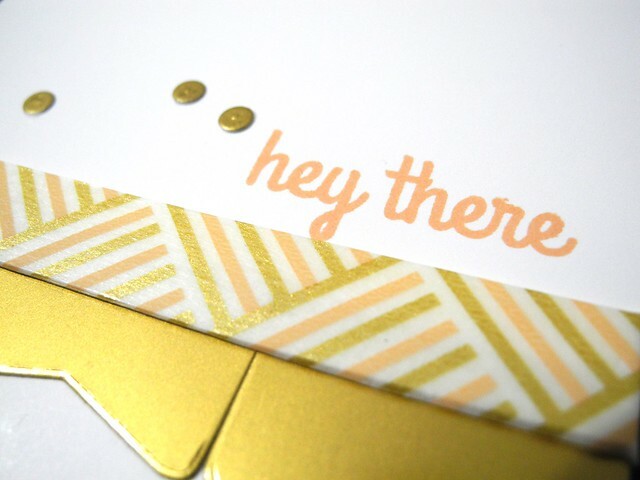 For today's card, I used the super fun 'Hey You' sentiment along with some seriously awesome dies! I die cut the bottom of the smallest tag three times to create the little gold cardstock border. This tag die is going to be used a lot! I can tell! I then used the tiny circle and the cool starburst, both of which were intended to be cool flower center stuff, independently for a fun, graphic look. I am in LOVE with that starburst shape! I layered my washi tape (for those who follow me on Facebook, this is the ver same tape that died due to puppy curiosity later that day... *sadness*) over some foam tape to give it a little extra dimension. I then stamped the sentiment in apricot. Be sure to head on over to the CAS-ual Fridays Stamps blog to see what the rest of the Design Team has created! This is such a fun release! Oh, this is totally fun!! Love the touch of gold! Very, very pretty, love the gold elements up in the corner. Quite striking!